A Federal Judge recently ordered a Missouri company to pay more than half-a-million dollars in OSHA fines following a fatal workplace fall. You can read more about the case here. The Missouri case involved two ironworkers using scissors lifts to access the top of a building. The workers were receiving a bundle of steel roof decking when one of them fell approximately 30 feet. The facts are eerily familiar to me. Why? I’ve helped an injured Alabama worker who fell under almost identical facts. In the last decade, I’ve represented multiple different workers who fell from significant heights where a scissors lift was involved. I have strong safety concerns about scissors lifts and how they are used on many worksites. 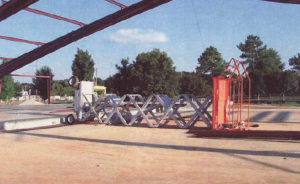 One of my past cases involved a steel erector who also fell approximately 30 feet on a construction site in Huntsville. While my client lived, he required multiple surgeries and is now totally disabled. His life changed in an instant. The Huntsville accident (just like the Missouri one in the OSHA story) could have easily been prevented by the company. A central focus of our jury trial involved management’s failure to meet its duty for safety on the site. In the Missouri OSHA fine case, foremen on the worksite were in a position to observe the workers. Yet, management did nothing to require fall protection. In my earlier Huntsville case, the same was true. That general contractor’s foreman actually stood on the ground below the raised lift holding my client, yet did nothing for days to promote safety. During my investigation and the discovery phase of the injury lawsuit, I obtained about 5,000 pages of documents related to the construction project. Yet, out of these documents, only one actually contained any site-specific safety discussion. Only one! The documents revealed management’s true (and only) concern — pushing the crew as hard as possible for extra hours and faster production. Although the file lacked safety documents or discussions, management made sure it obtained a daily weather discussion to avoid any delays in production! And, the general contractor also repeatedly pushed the subcontractors for faster work and fewer delays. Yes, yes and yes! All three of these safety violations were a problem in my Huntsville scissors lift fall claim as well. And, all three of these safety issues could have been easily fixed before something bad happened. I recently discussed the top workplace safety issues for 2017 on this blog. Sadly, the same issues are present year-after-year. Like other years, fall protection and fall prevention training are at or near the top of the list. Almost all serious falls can easily be prevented. Advance planning is crucial. Too often, advance planning is simply ignored in the rush by management to start work. I’ve discussed advance safety planning and the use of an Activity Hazard Analysis (sometimes called Job Hazard Analysis) previously. Once production begins, basic (and well known) steps can also be taken for safety. And, fall protection equipment can be easily provided by companies. I’m constantly shocked by the sites without proper safety equipment for the job. Why are simple fall prevention steps not taken? The answer is simple. Some managers and their companies place value on production over safety. I said “some” — because I see both safety-conscious companies and safety-reckless companies in my law practice. After helping injured workers over the last two decades, I’m convinced we need strong safety rules. And, we need real safety enforcement. We need to truly emphasize safety. It’s essential to the men and women who do the work. It’s essential to their families. And, its essential for those companies already taking the right steps. At the Blackwell Law Firm, we help injured workers. We understand Alabama workers’ compensation laws and the laws that govern negligent parties on a worksite. If you have suffered a serious injury, we are happy to answer your questions. Consultations are always free and confidential.